I find this kind of light and this time of day to be as challenging to capture as anything. The warm glow infuses everything with a golden warmth, yet there is still a definite contrast between cool shade and warm sunlight glow. In past efforts with similar light, I have literally infused the entire paper with a consistent warm undertone. 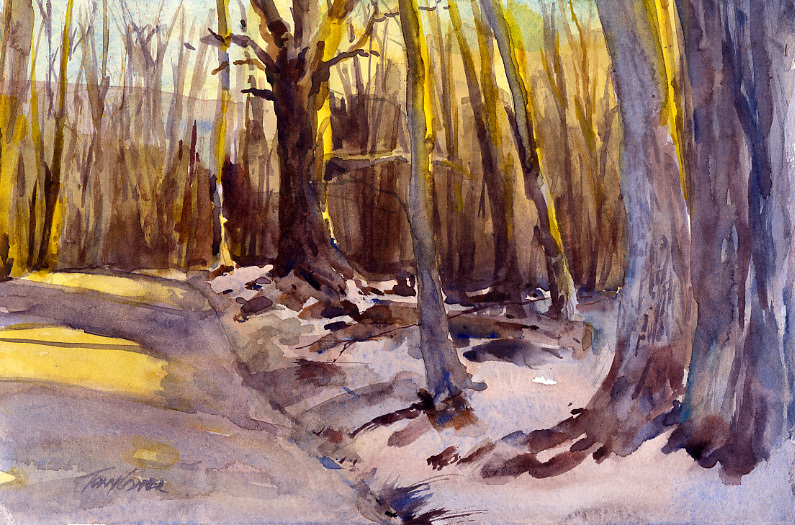 For this work, I tried to keep the warm, sun lit areas separate from the cool shady areas of snow, earth and background trees. But, I also kept the “cool” areas warmer than I might under different light conditions. For most winter scenes, the snow covered areas are usually painted with a cool blue-gray wash. 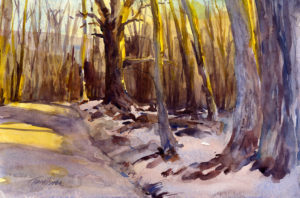 In this one, the shady snow, is painted with a warm, almost violet gray kept at a low intensity. Even though it is warm, it is still visually cooler than the bright, intense yellow orange used in the sun-struck areas. Solving the visual challenge was an interesting and thought provoking process. One I’m looking forward to tackling again.